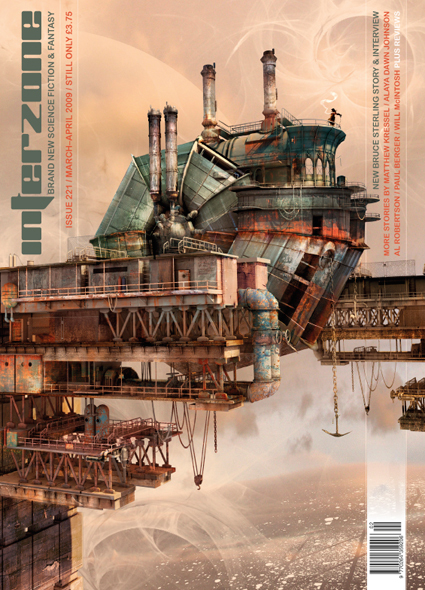 The next issue of Interzone, a british SF magazine, is due out soon. The issue features a story and interview with Bruce Sterling, plus a review of his new novel the Caryatids (which Cory Doctorow said was his pick for best book of 2009, already). The cover for this issue looks fantastic: modern covers seem to be placing most of the focus on the artwork and placing the graphics and text to suite each cover art individually. I've been reading IZ for several years after having seen it mentioned several times as the source of stories in SF anthologies and highly recommend that people who enjoy reading SF give it a try.